Pinhead is not Swedish, as far as we know. (“Umm, he’s English, actually, how else could he have served in the British Expeditionary Force in his original incarnation as Captain Elliott Spenser?,” asks the Internet, pushing its glasses up the bridge of its collective nose.) But a mass-produced, presumably pressboard version of the Lead Cenobite is available at Ikea, at least in the world of illustrator Ed Harrington. 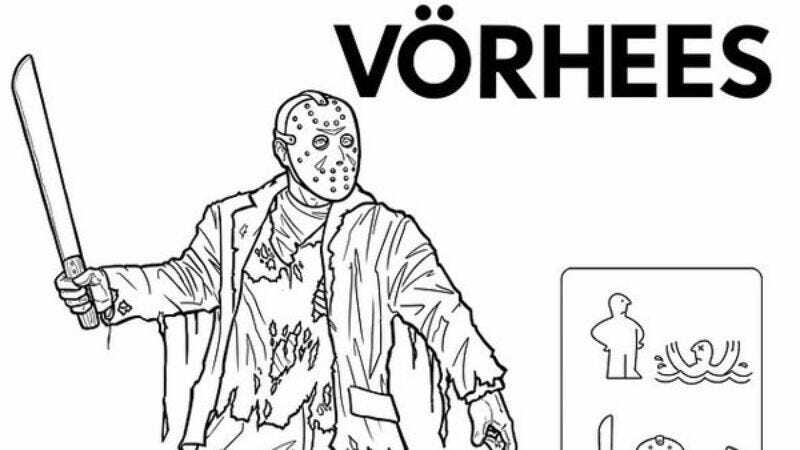 Harrington, who specializes in cheeky takes on pop cultural phenomena, has re-imagined five modern fright icons as Ikea products ready to be bought by recent college graduates to decorate their first nightmares. The illustrations are all pretty amusing, but the “instructions” are really where it’s at. (The “Human Centipede” calls for a scalpel, a stapler, a pair of medical scissors, wire, a hammer, and three perturbed-looking humans. Oh, and one of those s-shaped thingies (editor’s note: an allen wrench, you indoor kid…) you find randomly lying around the house all the time). They’re all easy to assemble and ready to help you live a scarier life—just don’t expect them to last past the third sequel.